Te Puna was established as a Maori Health provider to address these issues by providing high quality, accessible and affordable care and support. An alternative to "mainstream" services, Te Puna has grown remarkably and currently has over 10000 enrolled clients. These services are "wrap-around" with the client and their whanau at the centre, driving the process, and Te Puna Hauora offering support and expertise with those areas identified by the client. We call this our IMAP model, and it is central to the way Te Puna Hauora functions. You can find more information on the Te Puna IMAP model here(link to IMAP model). 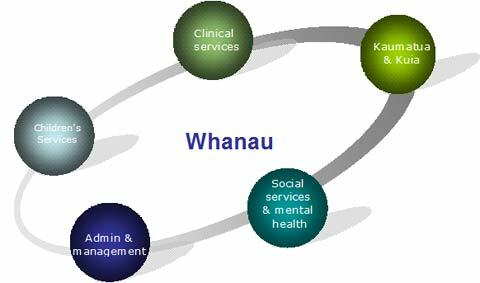 The wrap-around service means that a Te Puna client has access to a variety of different services. If you are looking for awhi (support) in an area of your life, please contact us and together we will work out the best course of action. We have comprehensive networks within the community, so we will know who to contact if it is outside our area of expertise. If you would like to get a better idea of what we can offer our clients, please use the menu on the left. Alternatively, contact us, we will be only too happy to hear from you.